I color embossed the background by rubbing my Close to Cocoa classic pad across the Finial Press Texturz plate and running through a piece of Always Artichoke. I discovered that you get a heavier inking if you run a couple of extra pieces of cardstock through the Big Shot. For this card, I liked the more distressed -- dirty? -- look of having less pressure on the cs. The oak leaves were watercolored and cut out from Lovely as a tree and layered across a piece of Riding Hood Red taffeta ribbon. Oh my gosh, will you stop it!! You keep coming up with these beautiful watercolored cards that I want to case. I don't have enough time, but it's killing me that I can't do all of them. I did case one of yours and posted on my blog tonight -- I had try at least one. Now stop it, I have to get my club cards done and they don't like taking time to watercolor. 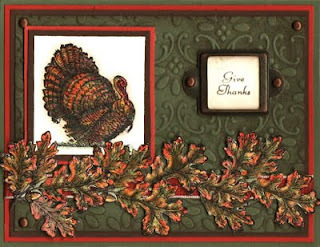 All kidding aside this is another gorgeous card - love the turkey. That's okay, Sandi -- I think that I'm tapped out for awhile! I loved your case with the rooster! Anything with a chicken is good with me. Another beautiful card :) I am going to try the color embossing today! Yay! Thanks for the inspiration. Love this card - the watercoloring is so pretty. I love the card and the technique with the embossing folder! Thank you for the inspiration. I will defintely be trying this technique.